Bill Streeter will show am exclusive sneak preview of footage from his documentary Brick By Chance & Fortune: A St. Louis Story. He’ll also air some of his favorite Lo-Fi Saint Louis clips. Details straight from Streeter’s fingertips. Galen Gondolfi of Fort Gondo is donating a choice pile of kitsch bric-a-brac as $1 a ticket raffle prizes. Items will be on display and small enough to cart of while drunk, if you win one. Michael Allen has a beautiful summary of why we’re fighting and celebrating. Soulard Stable Hootenanny, see ya there! 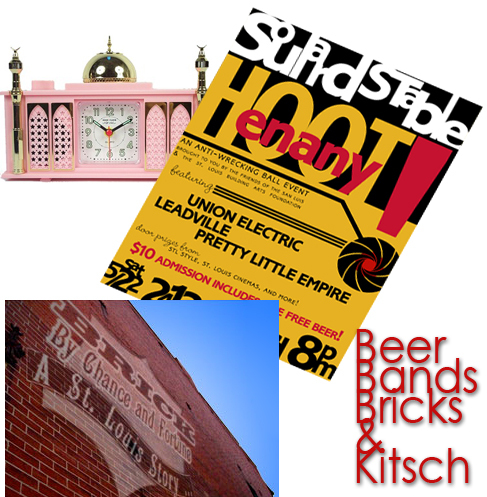 This entry was posted in historic preservation, south st. louis, special events and tagged anti-wrecking ball, bill streeter, friends of the san luis, galen gondolfi, leadville, michael allen, pretty little empire, soulard stable hootenanny, union electric by Toby Weiss. Bookmark the permalink.